We regret to report the death of Klaus Arp, principal conductor from 1981 at the Rheinische Philharmonie and the Opera House in Koblenz and from 1987 to 1995 at the Südwestrundfunk orchestra of Baden-Baden/Kaiserslautern. He was professor of conducting at the Heidelberg-Mannheim conservatoire and composed may works, including a Miles Davis Portrait and two operas. He worked regularly at the Opera Company of Philadelphia. So many people dying on SD! A great shame. I was involved in the opera he wrote for the Koblenz Opera while James Lockhart was GMD. Hiroaki Masuda, Klaus Arp’s successor as Erster Kapellmeister, conducted. It was a good piece, as I recall. As John says, there are too many people dying on SD at the moment. My dear collegue, hier in Mannheim. 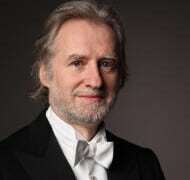 In November he conducted a wonderfull Mozart-Gala concert, fit as ever!